Playing fields, to the north of the West Winds estate, beside the Comber Road. 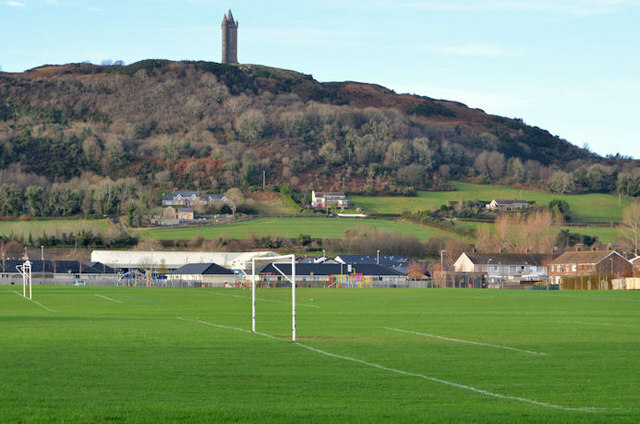 Scrabo Tower and Hill dominate the background. Designed by Charles Laynon, the tower was built in 1857 as a memorial to Charles Stewart, 3rd Marquess of Londonderry, who died in 1854. The design for the tower was held as a competition, with a strict limit of cost set at £2000. Lanyon's effort only came fourth in the competition but his design was chosen as it fell within the required budget - in actual fact the 135 foot tower was to cost £3010 to complete. The foundation stone was laid on March 6th 1857 in an elaborate ceremony attended by the new Marquess and Marchioness, the Bishop of Down and many of the county's gentry, preceded to the top of the hill by the Marquess's Highland piper. A jar was cemented into the foundations containing an inscribed scroll to the late Marquess, copies of local and national newspapers of the day, an Ordnance Survey map of County Down, coins of the realm and a list of 600 subscribers who contributed towards the cost of the tower - the list was headed by the Emperor Napoleon III of France.